As any good romantic comedy or steamy paperback novel will tell you, the man with the best strut, biggest biceps or fastest car doesn't always win the girl. 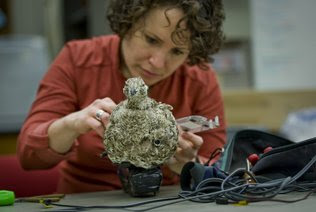 The same is true in the avian world, says UC Davis researcher Gail Patricelli. To examine the role that social skills play in mating, she and her team employ a custom-built robot bird, constructed mainly of radio-controlled airplane parts, to seduce the not-so-picky male greater sage-grouse into performing its mating dance. The fake bird, moving on model train tracks, allows the team to get a close-up view of the male's mating habits. Bright feathers play a role in helping females decide which males will make the best mating partner, but that isn't the whole story, said Patricelli. The goal of the research – which was presented recently at a Chicago meeting of the American Association for the Advancement of Science – is to move beyond a simple visual analysis and really understand the conversation of courtship, she said. With the sage-grouse, Patricelli found that it wasn't the loudest display that won, but the male that best timed his courtship display, ramping up once he had the female's attention. Don't miss the great "Fembot courtship" video at the Bee link. Fun footage of male Greater Sage-Grouse courtship displays! Albino Sandhill, young Whooper create buzz in Neb. The curious case of two rare cranes in central Nebraska is electrifying birders as the spring migration season looms. Spotted Sunday: A tall crane with pure white plumage mixing with grayish sandhill cranes. Spotted Friday and Saturday: A tall crane with brown feathering among a flock of sandhill cranes. One is an albino sandhill crane, one of four known albinos in a population of 600,000. The other is a juvenile whooping crane, an endangered species numbering about 258. 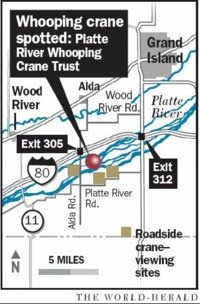 Both are rare and both happen to be in Nebraska, to the delight of Karine Gil, a researcher at the Platte River Whooping Crane Trust near Wood River. "This is extremely rare," Gil said Monday. "There are two white birds around." Once again, Peregrine Falcon fans can tune in for another breeding season featuring SW and Buckeye. The two birds of prey have raised young on a skyscraper -- Terminal Tower -- in Cleveland, Ohio, for seven years; SW (female) appears on the left, Buckeye (male) on the right. Scott Wright provides images for the educational project, as do the FalconCams sponsored by Cleveland Museum of Natural History. The direct link to the FalconCams, updated once a minute, is here. The Falcon Flash e-mail bulletins come from Deborah Mathies, with the Raptors In The City science curriculum for children ages 7-11. No doubt raptor fans of all ages can enjoy and benefit from the news bulletins (to which you can subscribe at the RITC site) and the FalconCam updates. The photo below, taken yesterday, shows SW and Buckeye in the nestbox on the skyscraper's ledge. They're showing courtship behavior, Mathies wrote. Good luck, SW and Buckeye! How many birders encounter a sight like this near their backyard birdfeeders? Q: Do the photos have to be taken within the last year to be eligible for this year's contest? Q: If I write for WildBird, can I submit entries for the photo contest? A: Yes, freelance contributors -- writers and photographers -- can participate in the contest. Only WildBird and BowTie Inc. employees cannot submit entries. Q: Do you have a minimum age for participants? A: The contest rules say nothing about a minimum age. Children and teenagers are welcome to submit entries. Q: Why, if I'm submitting a digital image, do I have to send a print with it? A: The initial evaluations involve prints only. If your print meets the judges' criteria, then they will evaluate your digital image onscreen. For this year's contest, the postmark deadline is May 15. Don't miss out on the chance for one of 16 prizes, including a Canon EOS 50D! Jim Arnold of Redding, Calif., won first place in the 2008 contest's backyard category with this Nuttall's Woodpecker. 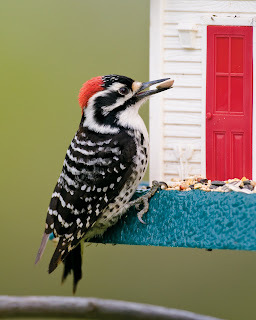 Backyard entries must show a feeder, birdbath or nestbox. The Marysville-based lawn and garden giant’s Scotts Co. LLC subsidiary this week launched a voluntary recall of five varieties of suet wild bird food products over concerns that they might contain peanut meal bought from Lynchburg, Va.-based Peanut Corp. of America’s Blakely, Ga., plant. Peanut Corp.’s products have become the center of a federal probe into a salmonella outbreak that has involved scores of illnesses and several deaths, including two in Ohio. Peanut Corp. originally only recalled peanut butter and paste but recently expanded efforts to include all peanut products made in Blakely since Jan. 1, 2007, Scotts said. The company said salmonella not only can affect animals but can pose a risk to humans who handle products tainted with it. No illnesses have been reported and products from the Blakely facility are no longer being used, Scotts said. Morning Song Nutty Safari Suet, 11 oz. Morning Song Woodpecker Suet 3 pack, 1.78 lbs. Royal Wing Raisin Suet, 11.75 oz. Scotts said customers should throw away the products and can request replacements or refunds at 1-866-512-8876 or scottswildbirdfood.com. The "Your Lands, Your Wildlife" program focuses on protecting wildlife in national forests and parks. The campaign stems from the belief that "the condition of fish and wildlife populations is an indication of overall land health, and that only healthy lands can provide sustainable benefits to current and future generations." The program recently announced winners in its story contest, which highlighted encounters with wildlife on public lands. The six categories -- grand-prize, backcountry adventure, birding, fishing, hunting, wildlife watching and photography -- offered various prizes to the winning authors. Stephen Kolbe of Stow, Ohio, won the birding category with his tale about Sandhill Cranes in northern California. This past summer, I was bird watching in Tahoe National Forest in California. The scenery was beautiful, with sharp, rocky ridges ringing a lush, green mountain meadow below. It was early morning, and the sun had just risen above the eastern ridge. I was watching the line of sunshine slowly slide down the opposite ridge into the valley below. Clouds of steam were still rising from the river that meandered its way through the meadow. I stepped down into the meadow and was immediately greeted with the familiar sound of the birds that lived there: willow flycatchers, yellow warblers, song sparrows and Wilson’s snipe. The rest of Stephen's story appears at the link above. Apparently the contest will not occur again, but if it does, I know some birders with writing chops who should participate. 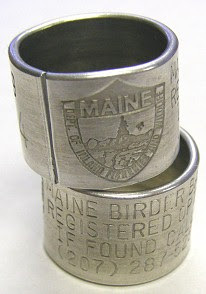 Maine Department of Inland Fisheries & Wildlife recently released the Maine Birder Band, an engraved metal band that fits onto a binocular strap and could help a birder recover lost optics via the registered number. More importantly, the $20 annual, tax-deductible cost contributes to habitat conservation. Maine's hunters and anglers through license fees and equipment taxes have paid for the bulk of these efforts. With declining funds available for non-game and endangered species work, our bird conservation efforts now also depend on Maine's birding community to help conserve what you care about. You can buy a band here. You do want some bino bling, don't you? Given the bird remains found in both engines of US Airways Flight 1549, known for its emergency landing on Jan. 15 in the Hudson River, there's been more discussion online and elsewhere about birds near airports. The next time you land safely in Seattle, you may want to thank Steve Osmek. He's the wildlife biologist whose job is to make sure that birds don't get in the way of airplanes arriving and departing Seattle Tacoma International Airport. Even though the bird strikes that recently caused US Airways Flight 1549 to lose both engines and land in New York's Hudson River has brought greater urgency to the issue, the danger presented by avian life is nothing new to Sea-Tac. The airport has had a wildlife biologist on staff since the 1970s, Osmek says, and annually spends about $250,000 on bird-removal operations. Osmek and a crew of about 20 helpers use low-tech and high-tech methods to guard against bird strikes. First, they combat the environments that attract birds by planting foliage that prevents them from landing and by covering any nearby bodies of water with netting. "The main thing is to make sure the birds are not used to coming here to the airport," Osmek says. "They don't get used to feeding here, nesting here and in turn coming into closer contact with the aircraft." Osmek then describes the various methods that he and his crew use to keep the birds and the planes away from each other, including avian radar. It's pretty interesting. 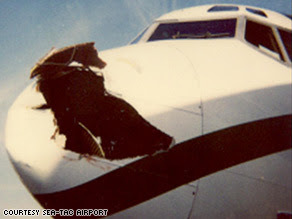 The photo shows the damage to a Boeing 727 when it collided with a Common Loon. That species typically measures 26 inches to 36 inches long and weighs 88.3 to 215.3 ounces (5.5 to 13.5 pounds). Look at the damage it created! Consider the potential damage created by a Canada Goose at 30 to 43 inches long and 105.9 to 317.7 ounces (6.6 to 19.8 pounds). That's the species often cited by wildlife agencies and biologists -- such as Osmek -- and airport authorities in discussions about controlling bird movements to reduce collisions. When she spotted a rare bird in her yard in December 2007, Connie Kogler didn’t hesitate to share. Nearly 500 people from many states — strangers to Kogler and her husband — crowded inside her Loveland home over four weeks to feast their eyes on a streak-backed oriole, the first ever spotted in Colorado. Even when she wasn’t home, Kogler still opened her living room to fellow bird lovers. 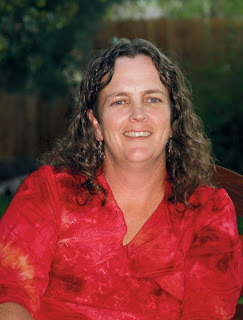 Now those and many other birders have honored Kogler by voting her WildBird magazine’s 2008 birder of the year. Koger is featured in the March/April edition of the national magazine, and she won a trip for two to Costa Rica with bird experts. At the hyperlink above, you'll find details about Connie's contribution this Saturday to the upcoming Great Backyard Bird Count as well as a link to her blog. Each year in January, the birding industry gathers in Atlanta for a trade show. At the 2009 event, Steve Moore of Birdwatch Radio interviewed various attendees, including yours truly. You'll find the recently posted podcast here, and you'll hear about different products and the making of a magazine, i.e. WildBird. Thanks to Steve for a fun interview! * How much of the warming during the 20th century was natural and how much was man-made? * Why have global temperatures been cooling in the last decade, and how long will that trend last? 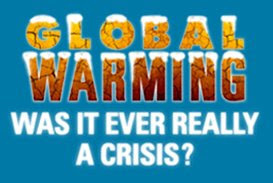 * What impact will the current international financial crisis have on efforts both here and abroad to curb greenhouse gas emissions? * How do present temperatures compare to the Medieval Warm Period 1,000 years ago? * What is the track record for forecasts made by computer models? By the IPCC? * Does India’s and China’s refusal to cap or reduce their emissions of greenhouse gases spell the end of international agreements on climate change? * Does new evidence reveal greater or lesser impacts from rising CO2 levels than computer models assume? Many more details about the conference here. In each November/December issue, WildBird subscribers have the chance to crown one of their peers as Birder of the Year. The candidates appear as Forum Birders and Backyard Birders in each issue through the year. The contest is open to everyone who responds to the questions posed in Birder's Back Yard and Lister's Forum. See pages 23 and 27 in the March/April issue for the current questions. As 2008 Birder of the Year, Connie Kogler of Loveland, Colo., will receive a Swarovski 8x32 EL binocular and an expenses-paid five-day trip for two to Costa Rica with Swarovski and WildBird hosts. She previously received a Swarovski squall jacket as well as "The Songs of Wild Birds" by Lang Elliott and the fifth edition of "Peterson Field Guide to the Birds of North America," provided by Houghton Mifflin when Connie was named Backyard Birder in the November/December 2007 issue. This year's prizes always appear in the Birder's Back Yard and Lister's Forum departments in each issue. Date and place of birth: June 24, 1960, in Hartford, Conn.
Children: We have a blended family of 11 (three boys, eight girls), ages 11 to 28. Favorite books: "Blue Like Jazz" and "Pete Dunne's Essential Field Guide Companion"
Favorite movie: "The Princess Bride"
Favorite television show: "The Life Of Birds" with David Attenborough. Who got you started in birding: A sweet gray-haired lady whose name I wish I could remember! She had a free-flying parakeet in her camper. She introduced me to the birds of the desert. We were camped in our buses at the Arizona-Sonora Desert Museum campground in Tucson in 1972. Most unusual backyard bird: again, Streak-backed Oriole. Hands down! Favorite feeder and food: Wild Birds Unlimited Eco-Tough Catch-a-Seed Tray with leg kit or on a pole; WBU's No-Mess Harvest, with a dash of millet and a sprinkling of mealworms. Yum. Short-term goals in birding: Get out there and bird; take Cornell Lab of Ornithology's "Home Study Course in Bird Biology"
Why you enjoy watching birds: They're so captivating. You never know what you are going to see or what they might do. Birds show the incredible diversity and creativity of my God, and I think they show a fun side, too. The individual adaptations that birds have to their environments are amazing, and I can't seem to get enough of them. Advice for birders: Take your time getting know your local birds. Enjoy the present. It's always good to pay attention to bird behavior, even with European Starlings and House Sparrows. Mentor a young birder, and have patience with the newbies. Listen to the stories of old-timers; you're gonna be one some day. Share the good ones, and always close the gate. Someone apparently hacked into an electronic road sign in Hamilton County Monday morning, prompting stares and giggles from motorists because of the message the sign displayed. 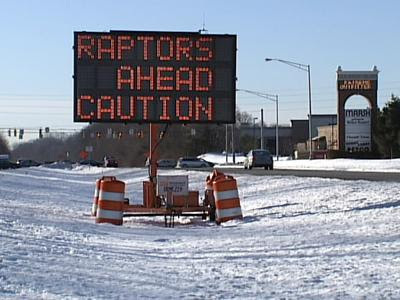 The sign, which read "Raptors Ahead Caution," amused motorists in a construction zone on Keystone Avenue, just north of 116th Street.